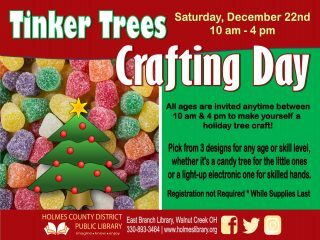 All ages are invited anytime between 10 am and 4 pm to make yourself a holiday tree craft! Pick from three designs for any age or skill level, whether it’s a candy tree for little ones or a light-up electronic one for more skilled hands. No registration is required, trees available while supplies last.